Before coming to the School of Geography and the Environment in 2017, Jocelyne spent a number of years in the University's Department for Continuing Education where, amongst other teaching activities, she created and directed the Postgraduate Certificate in Ecological Survey Techniques, which is mostly taught online. Previous academic posts include a college lectureship in Physical Geography at St. Catherine's College, Oxford; Research fellow at University College London; University Lectureships at the University of Reading and the University of Melbourne, Australia. Jocelyne holds a degree in Geography from the University of Cambridge and a PhD in plant ecology from the University of Tasmania, Australia, where she was a Commonwealth Scholar. Jocelyne's research focuses on understanding and quantifying the ecology, hydrology and management of wetlands and freshwater habitats. She has particular interests in the ecological role of micro hydraulic environments provided by aquatic plants in rivers and wetlands; water and nutrient cycling in wetlands; wetland vegetation dynamics; constructed wetlands; biogeography of aquatic plants; non-native freshwater species; freshwater ecosystem services; and the conservation of freshwaters. She is involved in a number of digital teaching projects and public engagement initiatives for wildlife conservation. Jocelyne has carried out field survey work in a diversity of freshwater habitats in Tunisia, Australia, Antarctica (Australian National Antarctic Research Expedition), Guatemala, and the UK, in order to answer a range of research questions. She is keen to discuss possible collaborations in interdisciplinary research in pure and applied freshwater processes/ecology. Part of a team carrying out field research and monitoring into plant-water relationships at Marley Fen in Wytham Woods, Oxfordshire. The results of the research are being used directly in the management plan for this SSSI site, as well as providing a long-term data set for wetland research. Co-supervisor of a research project investigating the ecological functions of a floating, constructed reed bed, Living-Filter, on Farmoor Reservoir, for water treatment. The DPhil was funded by Thames Water and involved an industrial collaboration between Aquatic Engineering, Thames Water and the Department for Engineering Science at Oxford University. The research involved field investigations at Farmoor Reservoir and lab experiments using bioreactors at Begbroke Science Park. 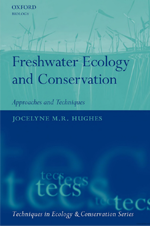 Jocelyne has coordinated and edited the Freshwater volume in OUP's Techniques in Ecology and Conservation series. This will be published in 2018. Partner in the Heritage Lottery Funded project hosted by the RSPB over two years, with the aim of making Oxford a Swift City. If you have reports of swift (Apus apus) sightings or locations of swift nests in Oxford please add your data to the RSPB interactive swift survey map. 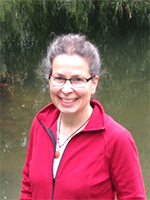 Jocelyne is course director of, and teaches on, the MSc in Water Science, Policy and Management. She has been teaching on the Water Quality module since 2009. Previously she has taught online courses at OUDCE in vegetation survey skills; and run vegetation survey workshops for zoologists at the University's Wildlife Conservation Research Unit. Learning practical techniques to undertake freshwater research is central to undertaking effective postgraduate studies or professional development. Jocelyne tries to underpin all her teaching with the practical skills needed to answer research or management questions. She has successfully raised grants from the Natural Environments Research Council (NERC) to teach doctoral training courses in practical skills in freshwater ecology, statistics, GIS, data visualisation and insect taxonomy. Member of the student-led VESPA project to develop an interactive digital tool that can be used across the University to teach sampling techniques. Funded by the IT Innovation fund at Oxford University, VESPA builds on the Virtual Meadow digital tool that Jocelyne developed in 2008. The SHOAL Project was funded by the IT Innovation fund at Oxford University and resulted in the Activity Browser which showcases Oxford-created digital activities for teaching. Activity Browser can be accessed via the University of Oxford Weblearn landing page on the left-hand browser (log in to Weblearn). Do contact Jocelyne if you have any innovative digital teaching resources to add to the collection. Together with natural scientists at OUDCE and the Cabinet team at the Oxford Internet Institute, Jocelyne is developing 3D digital models for teaching as part of the Cabinet Project. The project aims to create rock, invertebrate and plant specimens for teaching identification and taxonomic skills. Jocelyne is an external examiner at University College London. Hughes, J.M.R. (ed.) (2018) Freshwater Ecology and Conservation: Approaches and Techniques. Oxford University Press. pp. 480. ISBN: 9780198766421. Hughes, J.M.R., Clarkson, B.R., Castro-Castellon, A.T. and Hess, L. (2018) Wetland plants and aquatic macrophytes. In, Hughes, J.M.R. (ed.) Freshwater Ecology and Conservation: Approaches and Techniques. Oxford University Press. Lamberth, C. and Hughes, J.M.R. (2018) Measuring physical variables. In, Hughes, J.M.R. (ed.) Freshwater Ecology and Conservation: Approaches and Techniques. Oxford University Press. Tharme, R., Tickner, D., Zielinski, L., Conallin, J. and Hughes, J.M.R. (2018) Approaches to freshwater ecology and conservation. In, Hughes, J.M.R. (ed.) Freshwater Ecology and Conservation: Approaches and Techniques. Oxford University Press. Knight, C.A., Hughes, J.M.R. and Johns, T. (2017) What drives non-native amphipod distributions in the River Thames? The role of habitat and human activity on species abundance. Crustaceana, 90: 399-416.